This hymn about Eucharist was written by American liturgical musician and composer Michael Philip Ward (). It was first published in 1986 in the collection "Open our Hearts - Ten songs for worship ...at baptisms, confirmations, weddings, first communions, and other special celebrations". The song is based on Luke 24 and Acts 2 - the story of seeing Jesus on the road to Emmaus. The tune has a 4/4 time signature, and in the key of G the first few notes are DD DD DD E EF G.
Sheet music is currently available from WLP or Sheet Music Plus. It should not be confused with hymns of the same title by Bob Hurd or Timothy R Smith (and likely others). Arranged for SATB Choir or Assembly with descant, piano and Guitar. 1 In the walking on the road, we saw him. ... we knew he was alive! 3 But then we became afraid without him. 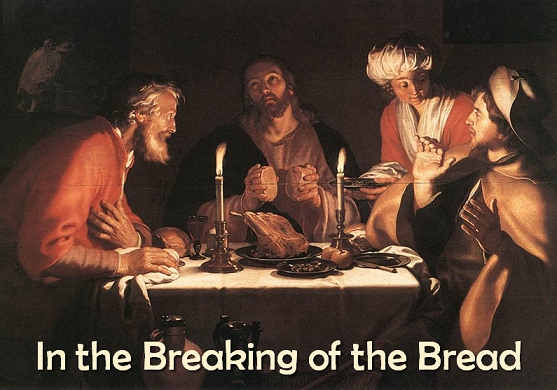 In the breaking of the bread, we saw Him! I know this song only from Kitty Cleveland who signs this on her Miracle of Divine Mercy CD. It is the most beautiful song written (by Michael Philip Ward) about the Last Supper, and events after His Resurrection, to wit: His first appearance to some of his disciples as they walked on the road to Emmaus after the Crucifixion, and finally the decent of the Holy Spirit upon Mary and the Apostles on Pentecost Sunday. Absolutely beautiful!